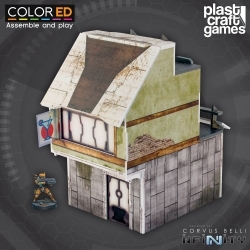 The Suburb Building comes in a pack that includes a set of individual pre-colored pieces. I picked up one of the new Plastcraft buildings today. I have to say these are as excellent as you want them to be. It comes in a very compact package and took me an hour to assemble. It goes together very quickly with super glue and has a good structural design. I was a little worried that with just the corners glued it would end up out of square and cause issues but the design makes it all fit together very well. The roof didn't want to stick at first as easily as the rest of the kit (it is made of corrugated plastic unlike the rest of the kit)but with a little patience and some direct pressure it holds tight. It is a bit heavier than I thought it would be but probably needs a little extra weight to prevent it from getting knocked around the table accidentally but you could probably get away with nothing added at all. The one recommendation would be that you use a knife when popping out the pieces as some of the connectors are pretty big and the surface detail will tear. All in all a great product.